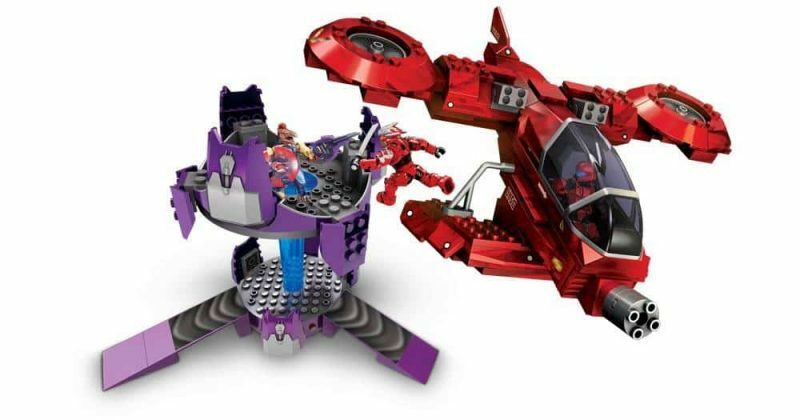 Barely 4 years after acquiring Mega Bloks, Mattel- the owner of Halo Toys is giving the brand a whole new look. Mattel acquired Mega Bloks- a Canadian toy brand- in 2014 for $460 million. 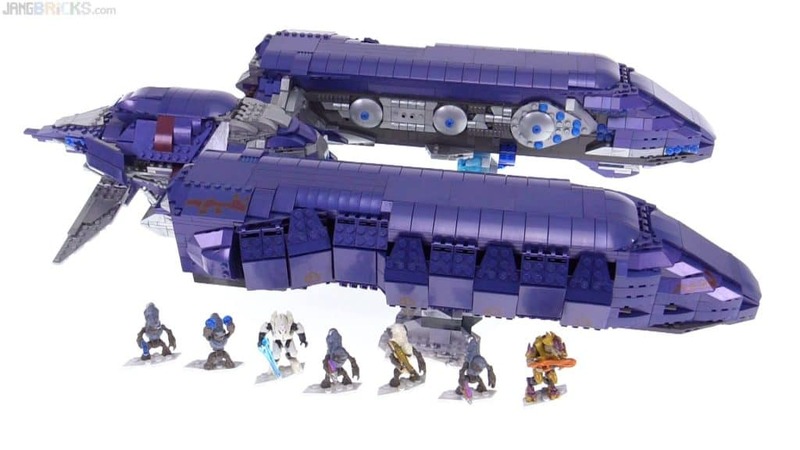 This year, Halo Mega Bloks got a name change through the resurrection of the Construx brand which slightly suggests an improvement in the quality of their toys. It should be remembered that Construx– owned by Fisher Price- was among the giant toy companies in the 1980s. Not only has the brand name changed from Mega Bloks to Mega Construx, but the packaging boxes also appear spiffier, and so is the new Mega Construx website. 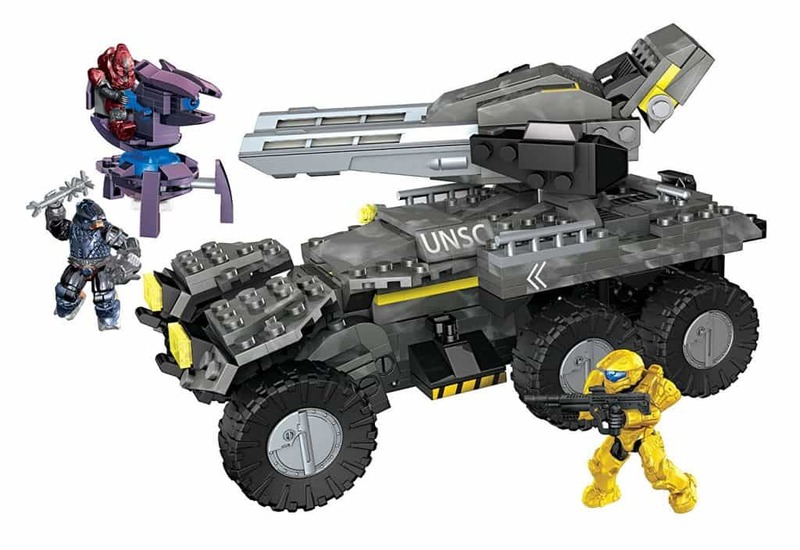 As of this year onward, halo mega bloks and some halo lego sets will bear Mega Construx name and logo on them. Mega Construx isn’t replacing Mega Bloks per se. It is simply a sibling line targeting older kids 4+ and collectors. Bricks from the 2 brands remain compatible. As such, Mega fans should expect endlessly fun adventure with a bevy of collectible micro action figures and a huge assortment of the latest toys. Are you a Mega collector and fan? Are you wondering what MB set to add to your collection? Worry no more! This article is a guide to some of the best halo sets that will add hours of fun as you triumph against the evil in Halo. We’ve also included a quick-second comparison table for each of the 2 categories to make things even easier for you. So let’s dive in! If you are a diehard fan of Halo and want a real challenge for your collection, this is the set to go for. 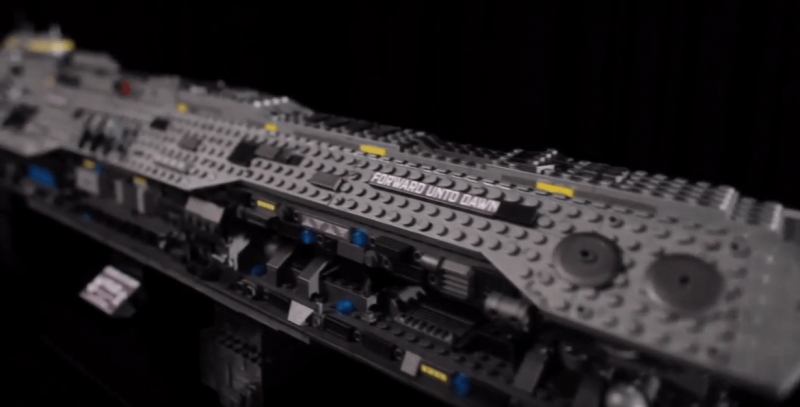 At 2,877 pieces, Forward unto Dawn is with no doubts one of the largest units we’ve come across so far. The sheer number of pieces is quite intimidating at first. Luckily, they all come in 4 separate boxes each with a detailed artwork on the inside top. Worth mentioning this set’s pieces have also been color-labeled. The essence of this is to make it easy for starters to know where each piece snaps. When fully put together, this is a massive ship over 3 feet long and up to 17.2 pounds in weight (too much for your kids!). 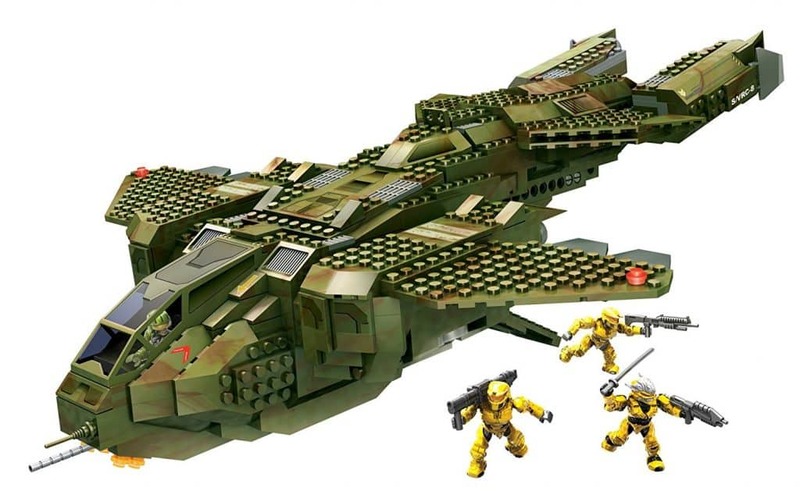 The fully assembled ship has large interior compartments for minifigs; Master Chief, 1 Elite, and 2 Space Marines. The minifigs have great poseability thanks to their excellent articulation. They can be put in their compartments by taking off 2/3rds of the ship’s roof. The ship has some rotating guns and movable levers. Mega Bloks Mammoth is ideal for kids of ages 8 and up. 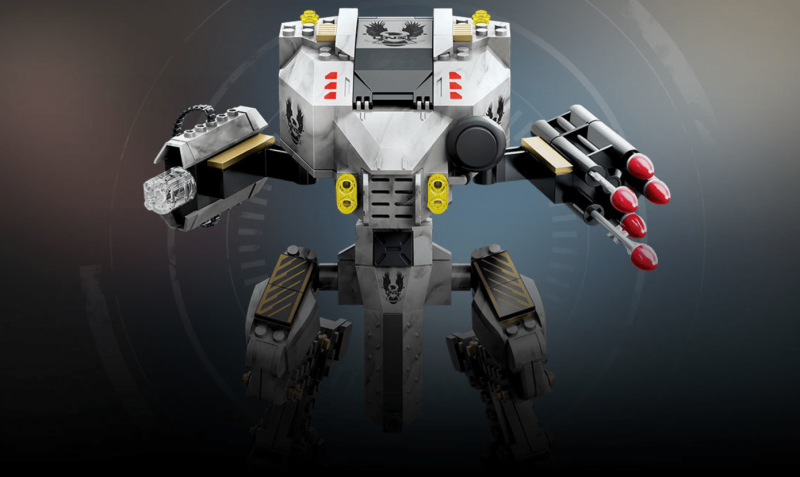 With 1,282 pieces, this is another extensive build with no equal in terms of power, size, and tactical faculty. This elephant may require up to 20 hours to set up. Luckily, it’s accompanied by an instructional booklet that offers your kid superb visual step-by-step directions. There are also color codes to show you where each piece snaps and inventory to manage the entire set. 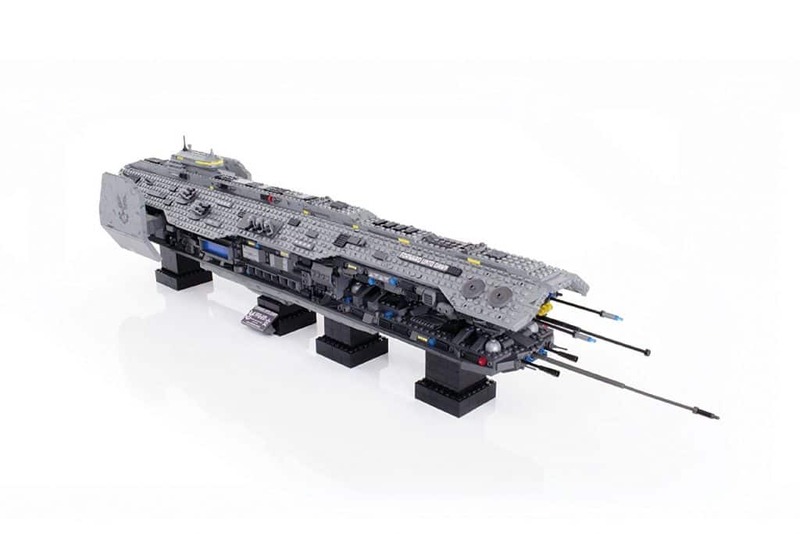 When fully assembled, the mammoth is a grand set with lots of size and space for a warthog or Cyclops. The Spartans also have some pretty cools colors. Uniquely, the 6 action figures have arms, legs, and heads that move freely in all directions. You also get 6 guns and other weaponry that they can clip on their hands. Here is another one of the best halo toys that anyone would want to own. This dropship is maneuvered by an Elite Pilot who can be put in the cockpit by pulling the removable roof up. It also has heavy cover fire coming from its 3 freely-rotating plasma cannons. 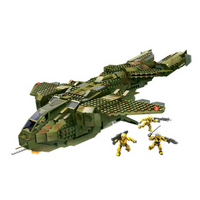 The dropship also boasts Halo Wars Arbiter and ultra grunts. Access to the troop holding bay can either be from the top or from the 3 side doors. The Pelican Dropship is another interesting model from halo sets and an essential anti-Covenant tool. 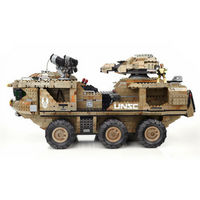 It features UNSC’s Covenant Banshee and Hawk combat vehicles. Its role is to deliver and drop troops, weaponry and war equipment to combat positions and back. The key to this ship’s versatility is its timely vertical, takeoff, and landing capability. As such, it can deploy and evacuate your troops within no time. This ship features 2 pilots who can be set in a fully functional cockpit. The troop’s bay can be accessed through the rear bay door. It accommodates up to 4 troops. This Pelican Dropship also carries 70mm chain gun and rocket launchers in its wings. For more successful missions, you can also attach a Scorpion tank or a Warthog to its tail. 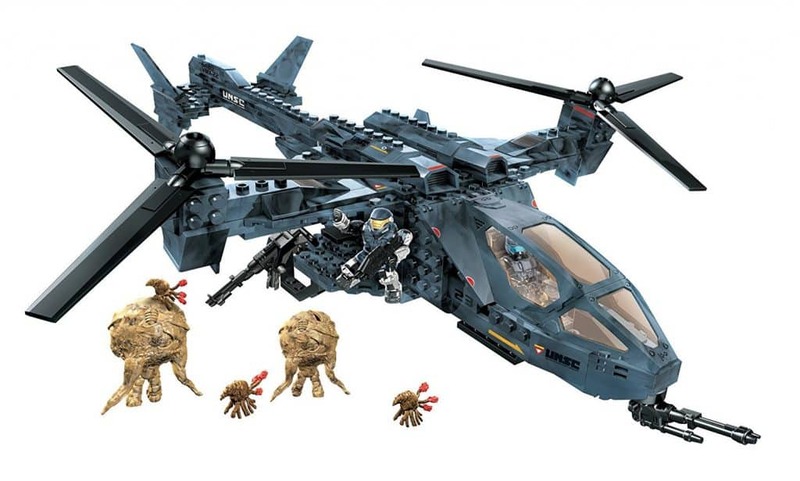 The last model in this list of the best halo lego sets is an affordable unit that comes at around 250 dollars. Prepare yourself to make merciless air and land attacks with this set. The ODST Covenant Invasion isn’t the latest having being released first in 2010. However, if you’ve not yet laid your hands on it, this beast is still as hot as new. You could still own it now and here. 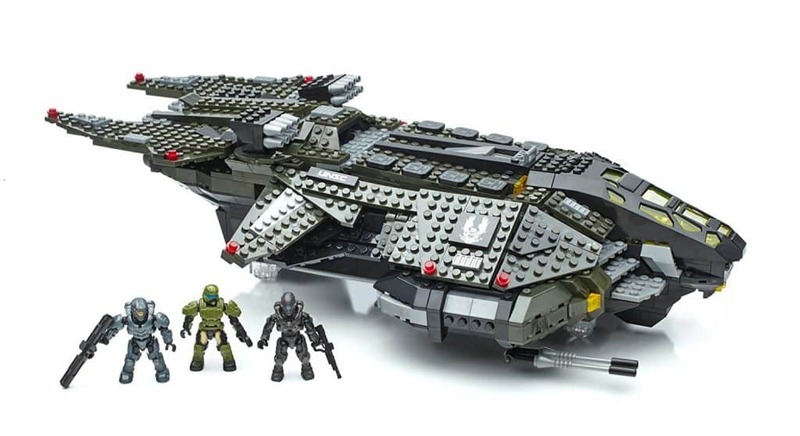 This set includes 2 halo lego toys, UNSC Scorpion, Covenant Vampire, and 3 mini-figures. Covenant Empire consists of grey, purple, and blue blocks. It also has Covenant logos and damage detailing. Covenant Invasion flaunts 3 engines at the back (in blue) and pink needles on the top of the cockpit. You can open the cockpit hatch to display the pilot with a control panel in front. The UNSC scorpion is the only type in its line so far. It has an impressive steel design with vehicle detailing and UNSC logos. Uniquely, each of its 2 parts has independent suspensions. Are you ready to take your battles to space? Then enter Mega Bloks Halo Countdown. 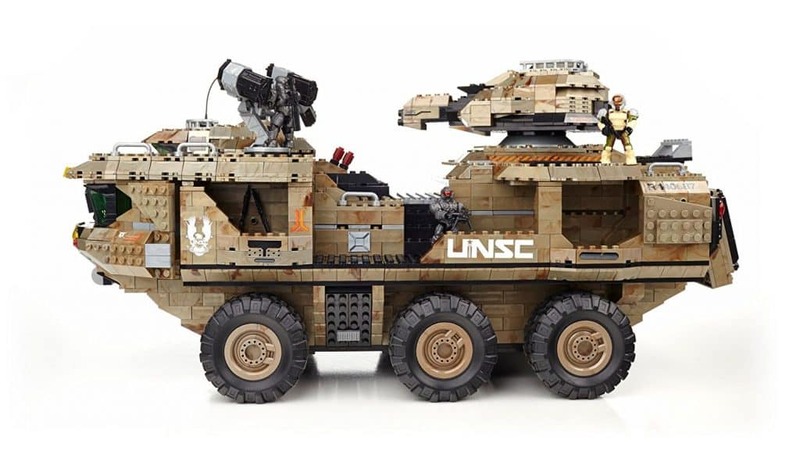 Commonly referred to as the UNSC Sabre and Gantry, this is a remarkable masterpiece that brings a space fighter and a truck load of other goodies. It was released in 2011 and is ideal for 8+ kids. What makes Countdown the best of Halo toys is the great detailing that Mega Blok has put in it. The package includes the UNSC Sabre, a gantry, and 6 mini-figures. It includes 2 UNSC marines each with a backpack painted in matching colors. There’s also a UNSC Sergeant, a technician, UNSC Spartan, and an officer. The gantry primarily consists of yellow, silver, black and transition blocks. It also has UNSC, stars, warning, and control stickers. It has lights, an antenna, and dish at the top. The Sabre consists of black, orange, white, and black blocks. It has 3 removable rockets that propel it from the atmosphere into space. Mega Bloks Spirit Dropship is yet another great kit from Mega Halo if not the best of them all. We are still scratching our heads in disbelief of how such an impressive and practical set with all the generous parts could come at such a price ($129). 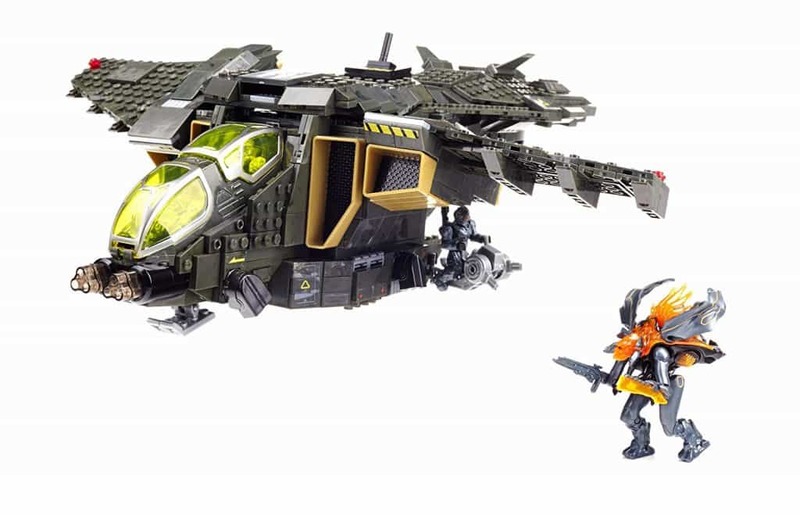 Spirit Dropship requires 2,281 pieces for full assembly. The finished product features a stand and a bunch of figurines. It’s not quite as big at around 25-26 inches long, but it’s still large enough to catch eyes. This machinery features 18 infantry side doors that open up and down to reveal great depths to carry several figurines and weapons. The set has 7 figurines; 1 elite commander, 1 Elite Zealot, 4 Grunt minors, 1 Imperial grunt. However, it has enough space to carry between 12 and 16 figurines and up to 2 ghosts. 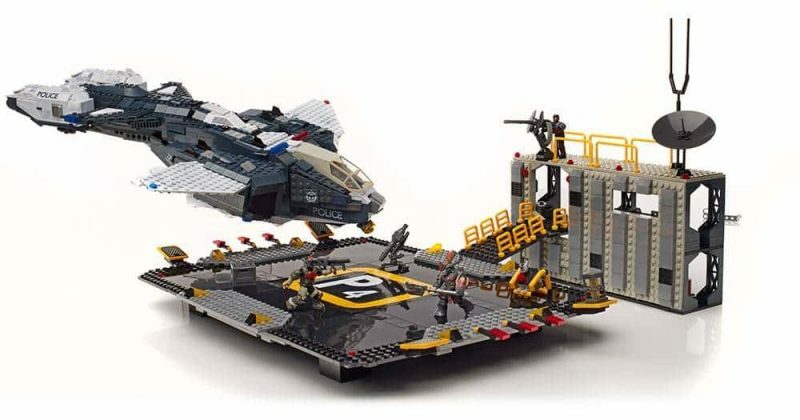 Mega Bloks Halo has yet another impressive set here; Pelican Air Base set. Consisting of 1792 pieces, this model adds an entire police department consisting of a buildable air base and NMPD Pelican Dropship. The dropship has well-articulated wings and rear engines, a rear hatch, troop bay, and an opening cockpit. The landing pad has a deluxe print and is well detailed with a command center, communications dish, storage bays, and machine gun turret. The NMPD Pelican Air base is served by a bunch of super poseable micro figures including 1 ODST Mickey, 1 NMPD Officer, 1 Pilot, and 1 Brute Chieftain. The Pelican Gunship 97129 is, hands down, one of the best halo 5 mega bloks sets ever released. What’s most amazing is that it retails at below 100 dollars on Amazon. It’s huge, well detailed, and impressive to add to your collection. The good news with this set is that it brings 5 authentic game sounds and lights to your halo collection. The gunship is made of 1,100 pieces and has a trigger button for the 5 sounds. It also has a spacious dual cockpit and a hangar bay with a top opening hatch. 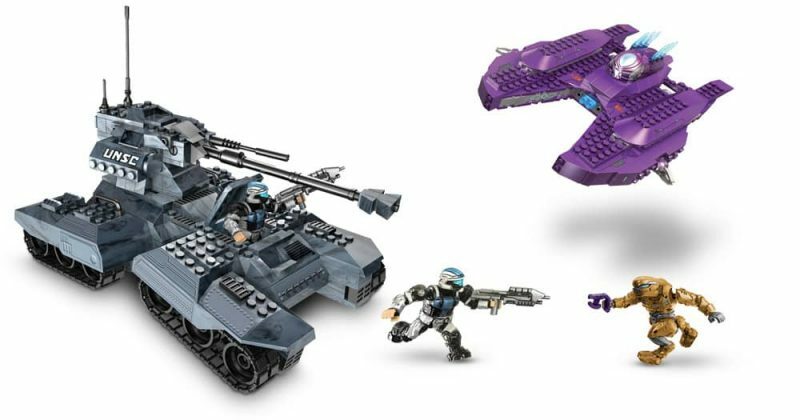 Pelican Gunship brings a set of 4 micro figures: 3 articulated Spartans and a new Promethean Knight Battlewagon. There is no other great way of engaging in some orbital combat than having the UNSC Hornet VS Covenant Vampire set from Halo Mega Blok. For those who’ve just started out, you’ll be glad to add 2 units to your collection with a single purchase. The Covenant Vampire in this set has a sleeker design than our previous model, and so is the Hornet. Like the Pelican Gunship 97129, this Hornet has neat electronics with superb in-game sounds and light-ups. The new turbine design with the Hornet will certainly blow you away. This set also comes with 6 mini-figs for your collection: 3 Spartans, 2 Elite Zealots, and 1 Grunt. 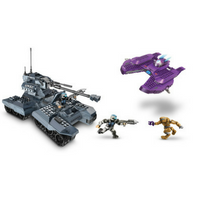 So what is your Mega Bloks Halo collection lacking, a vehicle that will drop your troops right in the middle of your enemy territories? Enter the UNSC Vulture. This set costs around 80 bucks on Amazon and almost half of that at any of Toys R Us stores. Do your maths and choose where to get yours. This behemoth seeks to bring the Covenant to its knees with its massive power either from the ground or the air. It has buildable auto-cannons, a vertical missile, and rocket pod turrets. The cockpit and the armory are accessible via the gunship’s canopy. It also has 3 micro action figures and several interchangeable weapons; DMR, M6D, and Rocket Launcher. 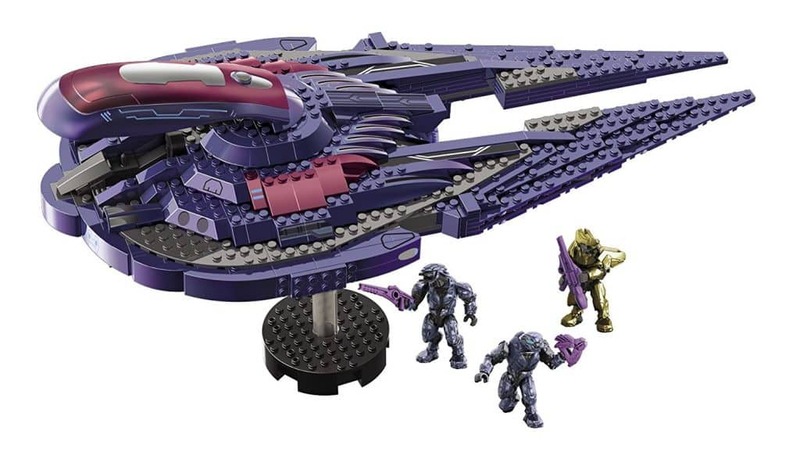 Next, is another favorite Halo Mega Bloks set for people who enjoy building model spaceships. UNSC Broadsword Midnight vehicle represents Halo 4’s final mission- Midnight- where Broadsword is used to attack the Didact’s ship. This 716-piece set may be too overwhelming for kids below 6 years to build. So, parental help is recommended. When complete, the F-41 firefighter is great and has several moving parts. This set also comes with 3 detailed micro figures. The Didact is massive at 13 feet. The Master Chief has articulated shoulders and a removable and customizable armor. You also get a load of weaponry. Also referred to as the Warthog of the Skies, UNSC Falcon is another irresistible set that you should consider adding to your collection. This is a very good looking model consisting of a spaceship and a landing pad. The 2 take a total of 503 pieces and only requires a few hours to set up. UNSC Falcon uses 2 gigantic propellers to take your troops to and from battles. It’s also heavily armed. It boasts 2 guns at the front and another M247H heavy machine gun mounted on its one side and manned by a Mark V air assault Spartan. Collectors are also raving about its opening cockpit and a weaponry box. Anyone who collects the Floods shouldn’t lack the Hunter’s Falcon in his/her collections. 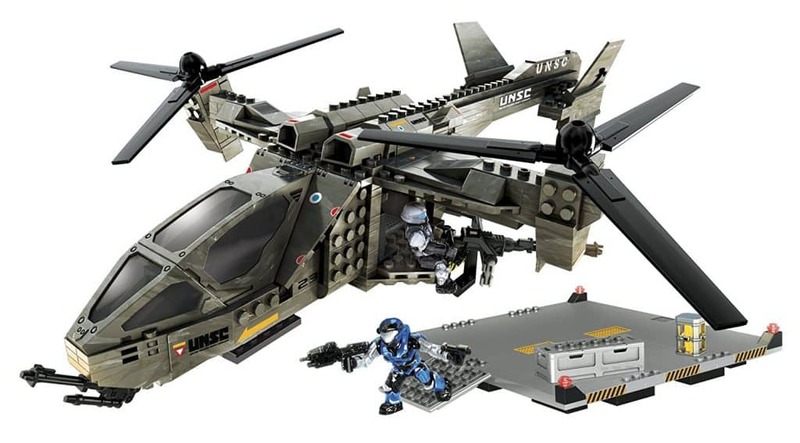 This set is quite similar to UNSC Falcon above only that it does not have a landing pad. It also uses fewer pieces, and it’s cheaper, of course. The Flood Hunter’s Falcon will be flying deep into new territories to scan possible Flood outbreak. Like the former Falcon, this one also has a Spartan manning a side mounted Heavy machine gun. The Spartan spots possible infection and Carrier Forms infesting the area. 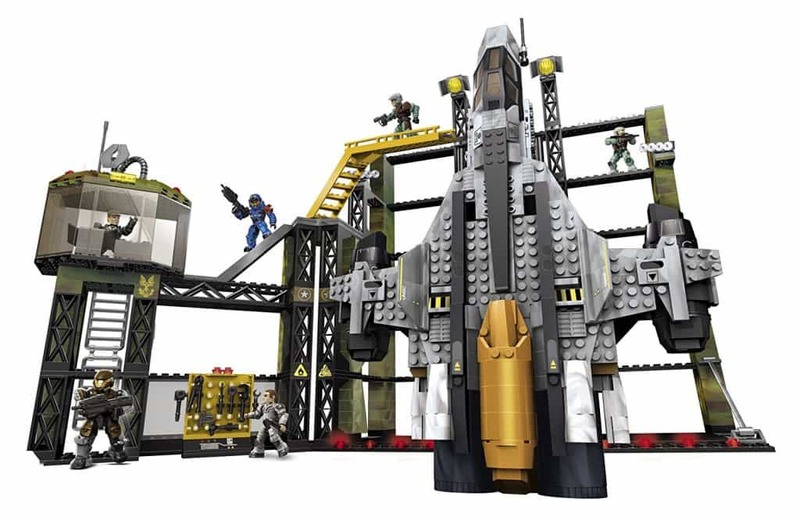 Wasp Strike building set is Halo’s latest addition to their line. This is a furious vehicle that lets you unleash merciless firefights in the warzone with a range of weapons including front rocket launchers and articulated ailerons. Sure we’ve seen several other Wolverines similar to this one from Mega brands. However, this one stands out in several aspects. First, it has more playability for everyone including kids. For instance, this one involves building the entire set including the missile pods from scratch. Second, this version has an engine build that we didn’t see in the previous versions. There are also 3 micro figures. Our last recommendation (but not in any way the least!) is the Halo Covenant Seraph. This is a pretty good piece with good quality bricks that snap easily to each other. Of all the sets that we’ve come across, only Seraph has the least complaints about bricks that are tough to attach to each other. The manufacturer recommends it for boys aged 8 years and above. However, anyone else can enjoy building it. Covenant Seraph is a versatile multi-role fighter in Covenant war. It comprises of 566 pieces. This starfighter stays suspended in the air by a stand measuring about 3.5’’ tall. It has a pair of Plasma cannons and a protective Energy Shield. You also get 3 covenant figurines. 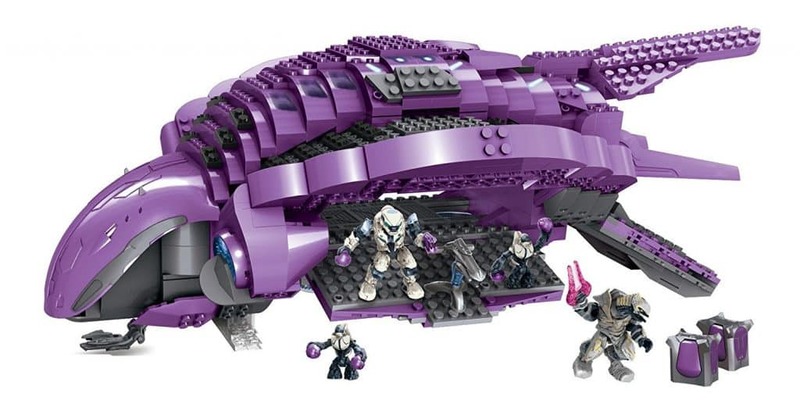 The best Halo Mega Bloks set to go for is quite subjective. It depends on the level you’ve reached and what toys (vehicles and figurines) you have in your collection. 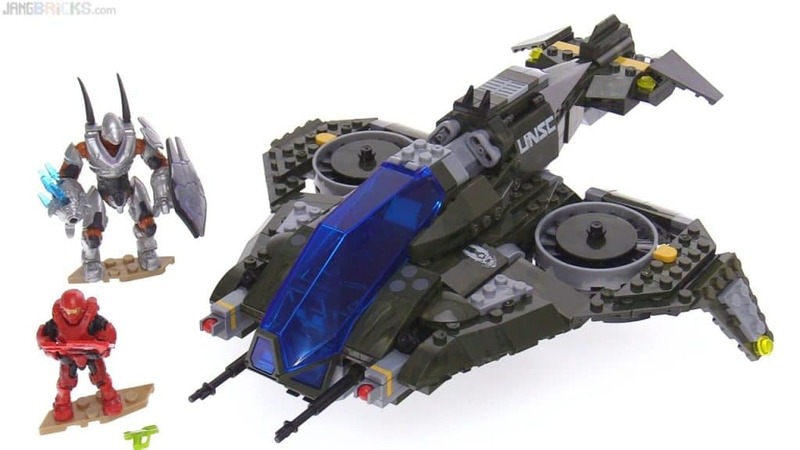 If you are just starting out, an inexpensive set like UNSC Hornet vs. Covenant Vampire 97123 might be a great set to consider. It’s not only affordable, but it also brings 2 toys and a bunch of figures to start with. 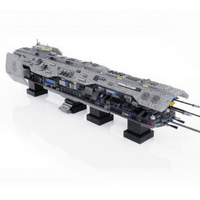 If you’re looking for the latest additions in Mega Construx, Covenant Spirit Dropship, UNSC Pelican Gunship 97129, and Pelican Air Base 38761 are worth checking out. That’s it! 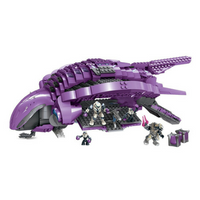 We hope that our list of the best Halo Mega Bloks was of great help to you. We’d also like to hear from you. How did you find these sets? Do you have any experience with some of these units? If so, do tell us about it in the comments section below before heading out.